Under New Jersey estate law and durable power of attorney allows a person to appoint another person (or two people can act as co-agents) to take care of all non-medical matters on the signer’s behalf. Because it is a durable power of attorney, it takes effect when signed and remains in effect after the signer no longer has capacity to handle her own affairs. If a a durable power of attorney in not executed quickly after being diagnosed with dementia while the signer still has the mental capacity to do so, those caring for the incapacitated period will need to commence a guardianship proceeding in court to have the person declared incapacitated and have a guardian appointed. This court proceeding is a costly, time consuming and emotionally draining experience. One simple document, the durable power of attorney, properly drafted and executed, precludes the necessity of going through this difficult court proceeding. It has the added benefit of allowing the signer to decide who will act on her behalf if she becomes (incapacitated in a guardianship proceeding the court makes that decision). The signer can also appoint a successor agent, in the event the first person chosen can no longer fill that role. Much like the power of attorney, under New Jersey estate law the health care proxy allows a person to appoint another to act as their agent to make medical decisions in the event the signer is not able to make those decisions for herself. The person gets to chose who will make these important medical decision in the event they are unable to do so. Unlike the durable power of attorney, the health care proxy is not effective until a person is no longer able to make decisions for themselves. A living will is an important estate planning tool. Under law New Jersey estate law, a living will does not become effective until it is provided to a physician and that physician has determined that the patient does not have the mental capacity to make their own health care decisions. The main purpose of the living will is to allow a person to articulate instructions for when they are unable to do so. It can direct that certain life-sustaining treatments be provided or withheld. It can direct that maximum pain medication be provided. It can be tailored specifically to the wishes of the signer. 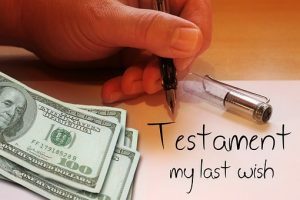 A person who has been diagnosed with early dementia, may still have the capacity to execute a last will and testament, most important estate planning document. In a will, a person decides who will receive their assets, known as beneficiaries, and what those beneficiaries will receive, called bequests. It appoints an executor, the person who administers the estate, i.e. gathers and distributes the assets, and if necessary trustees to oversee assets which may be bequeathed in trust to a beneficiary. Once a person becomes incapacitated, they can no longer execute a will and then their property will pass through the laws of intestacy. The estate planning attorneys at McLaughlin & Nardi, LLC can assist in formulating plans and preparing these documents which will benefit the person diagnosed with dementia and their loved ones who will care for them over time. If you would like assistance in preparing these documents, please call (973) 890-0004 or e-mail our office.